Just behind our cottage is a large area of woodland. Since it was too damn cold to lie out in the sun or take a canoe ride (yes, the weather did change suddenly), I decided to take a walk. Couldn't forget my camera, of course. You never know when a Pulitzer Prize winning subject might suddenly jump in front of me. 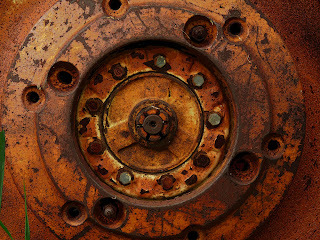 I started off by taking a picture of our ancient tractor. I think it dates back to 1943 or something which is ancient in my books. I call it the death tractor because a couple of summers ago, it tipped and crushed my brother as they both toppled into a ditch. He managed to get away with just a broken elbow but it could have been a lot worse. The problem with this piece of equipment is that the two front wheels are very close together, making it quite unstable. I entered into the woods and although there wasn't much animal life to shoot (in the picture sense), I did manage to catch a few photos of the flora. 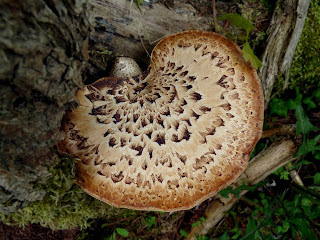 For example, we have a large tree fungus. 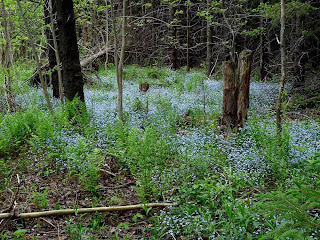 And the Forget-Me-Nots were in full bloom. 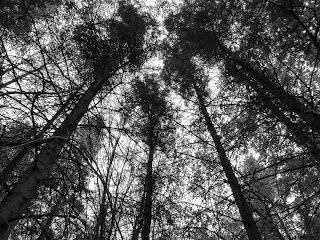 And we have several trees together, which is why I called this a walk in the woods. 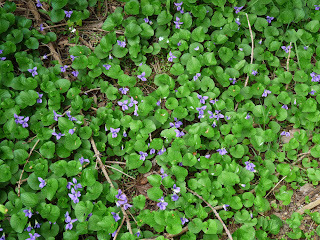 And there were even wild violets. Am I boring you yet? I think I'm boring myself. 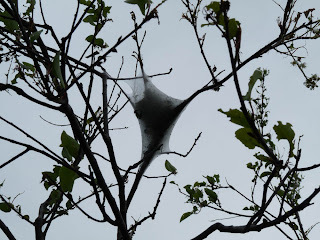 These are tent caterpillars. Apparently they are very nasty and not good for the trees. At least, this is what my dad always told me as he soaked them in gasoline and torched them. I have never forgotten my childhood image of burning caterpillars falling from the trees. Squirming and wriggling and burnt. Just not a very good way to die. And finally I stumbled upon two creepy looking wood figures. I thought the guy was bleeding from his throat until I looked closer and realized that it was probably a bad depiction of a bolo tie. I'm not sure who wears a bolo tie in Canada but I think this was what the artist was trying to represent. I think the other figure was an Eskimo, which is much more Canadian. 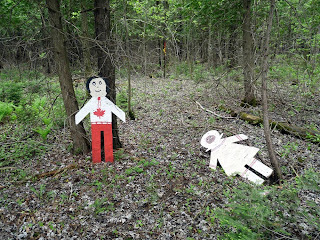 These figures were even more disturbing considering that there is a dead child lurking in our area. Victoria Stafford, an eight year old girl, went missing last month and is presumed dead. They have recently combed our lake and the cottage area for any evidence that could lead them to the body. So far, no luck. It's like a real life "The Lovely Bones." It's not a book that I heartily recommend unless you like reading about a child being murdered. I couldn't even finish it. Apparently it is being made into a movie by Peter Jackson. Yep, the same guy who did The Lord of the Rings trilogy. But in all fairness, he also did Heavenly Creatures so he does know something about contemporary murder. Anyway, I'll leave you on a more upbeat note. 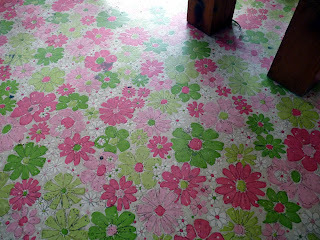 Here is a picture of our linoleum floor in the cottage. Yep, it looks like a clown threw up. Santa Barbara is on fire!